If its mountain scenery you are looking for, then Austrian alps would seem like heaven of heavens. Behold for breathtaking landscapes, hiking routes that reward with extraordinary views and cities that take you back to the 16th century. A skiing destination during winters, Austria turns into a hiking hotspot in summer. During our road trip to Austria, we covered the Hohe Tauren National Park region which was nothing short of spectacular. 7 days may seem a lot while making plans but is meager to the beauty this part of the country has to offer. We also covered the state of Salzburg during this trip which you can read about here. Austria’s oldest and largest national park spreads over the state of Salzburg, Tyrol and Carinthia. Characterstic to the national park are more than hundred peaks over 3000m height, lush green alpine pastures and dramatic waterfalls. We visited the Kaprun Hochgebirgsstauseen, Zell am see lake, Krimml waterfalls, Grossglockner Hochalpenstrasse and the Pasterze glacier within this mammoth national park. After parking our car at the Kesselfall Alpenhaus, we followed directions for the ticket counter. Soon after, we were transferred by bus to europe’s largest- Lärchwand open inclined lift. 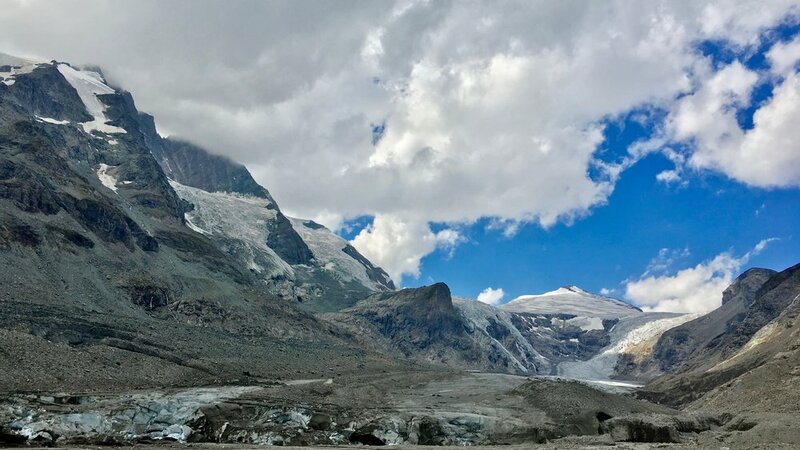 The route leads past the bottom of the waterfall to the Mooserboden reservoir at an altitude of 2040 m, affording a wonderful view of the Hohe Tauern glaciers. Walk on the wall of the dam, but there are of course, also a lot of marked hiking routes. We climbed all the way up to the rocky ‘Hohenburg’. The view from here were nothing short of spectacular. To know more about the Kaprun Hochgebirgsstauseen visit this website. Do not forget to pick up the handouts at the ticket counter. They have a lot of hiking trail maps and other information. Krimml waterfall is a three-tiered waterfall. It begins at the top of the Krimml Ache Valley and plunges downward in three stages- upper, middle and lower. The lower ache fall can be reached on foot from parking and from there begins a trail- 4.15km long with a difference in altitude of 431m. It took us about 90 mins to get to the top of the fall and I would highly recommend this trail. The sound of the cold water crushing on the ground will keep resonating in your ears throughout the hike. Expect a steep hike through lush green, dark woods. Imagine this trail to bring you up close to the waterfall. It does so by the various observation decks, which I would rather call experiential deck, along the route of the trail. The view of the waterfall from these decks are breathtaking and if you are lucky enough, you might spot double rainbows. The ticket counter closes at 6 PM, post that you can access the trail for free, at your own risk! We found this website to have a lot of information about the trail. The pyramid shaped peak of Grossglockner is the highest mountain in Austria and situated along the main ridge of the Central Eastern Alps. The scenic high alpine road is the highest (2504m) mountain pass in Austria. The vistas and views of winding roads from various spots along the road is worth it, especially when you have to pay a maintenance tax before entering the road. For more information you can checkout this website. Once you reach the top of Grossglockner high alpine road, visit the Kaiser-Franz-Josefs-Höhe. From here you can have a direct panoramic view of the Grossglockner mountain and beneath it the Pasterze glacier. Do not forget to look at the peak of the Grossglockner mountain from one of the spotting scopes. Look closely and you might be able to spot mountaineers conquering the highest peak in Austria. The 8.5km long, Pasterze glacier is the longest glacier in the Eastern Alps. You can either hike till the bottom of the glacier or take the funicular down. The funicular covers the most strenuous part of the trail. You still have to cover a good chuck on foot but that is mostly covered by stairs or comfortable slopes. The trail is full of beautiful views. While going down, you will see sign boards with year marking on it. The markings denotes the position of the glacier in that year. As a result of climatic shifts, the glacier is fast retreating. While reading this, it may pass down well, but only when you visit the glacier, does it hit you hard! We hiked the entire trail and it took us 50 mins for the hike down and 75 mins for the climb up. Good hiking shoes are highly recommended! Overall there is a lot to explore in the largest national park of Austria and there is a whole of bunch of things to do in these places. Whether its driving on the thrilling Hochalpenstrasse, hiking to the glaciers, or strolling along the serene Zell am See, Hohe Tauern soaks you up completely in nature! The drive itself is mesmerising at all times, so much so, when you close your eyes, all you see are the beautiful snow covered mountain peaks, landscape covered in various shades of green, picturesque towns and the endless winding roads! Have you been here too? Share your experiences with us, we would love to know about them.